Dense tree crowns, high branches and thick greenery often make for tricky environment. 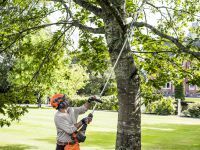 Husqvarna's professional pole saws are lightweight and designed for superior reach, balance and performance. For more information on Husqvarna's pole saws, visit this page.